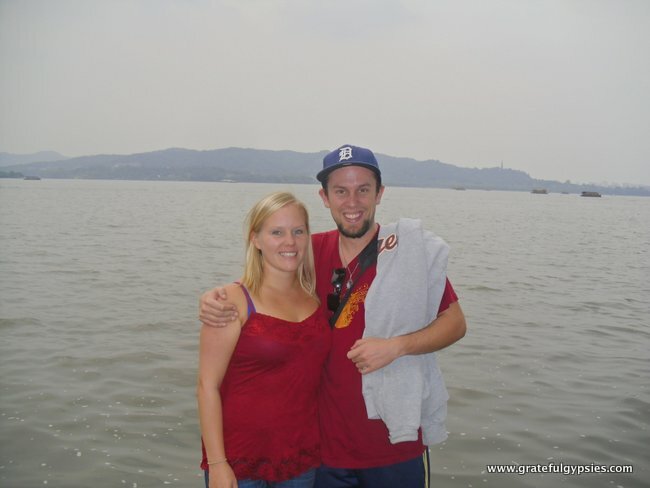 After two days of Shanghai, we took a quick hour train ride over to Hangzhou, the capital of Zhejiang province. 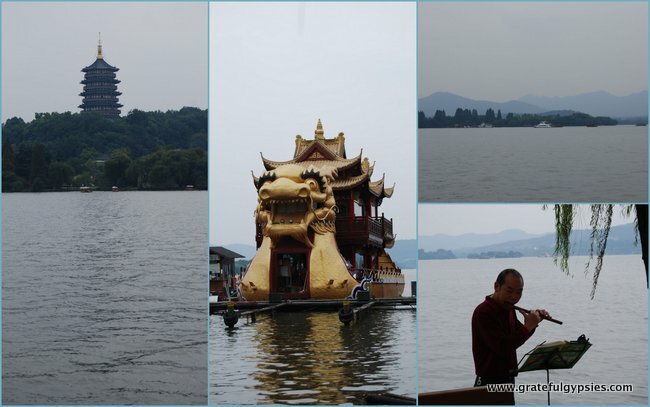 Famous for its natural beauty, the West Lake of Hangzhou has inspired poets, artists, and writers for ages. Actually, the image of the lake is one that you’ll see very often in China, thanks to the fact that it is on the back of the 1 RMB note. The famous West Lake of Hangzhou. As you can imagine, the place was packed full of tourists on our visit during the National Day. The Chinese idiom “people mountain, people sea” (人山人海) sure was applicable on this trip. Popular amongst Chinese travelers is a checklist of “10 Scenes of the West Lake.” Flag waving, mega-phone wielding tour guides herd matching-hat wearing tourists like sheep from one to the other, attempting to check them all off in one day. We opted for the more laid back approach, as we simply strolled around the lake and stopped whenever we felt like it. Although we avoided all of the various temples and pagodas that you have to pay extra for, we did dish out a few kuai to take a short (and I mean short) boat ride. The West Lake and an awesome night market are highlighted in this video. That night, we saw a performance of the incredible Impression West Lake show. 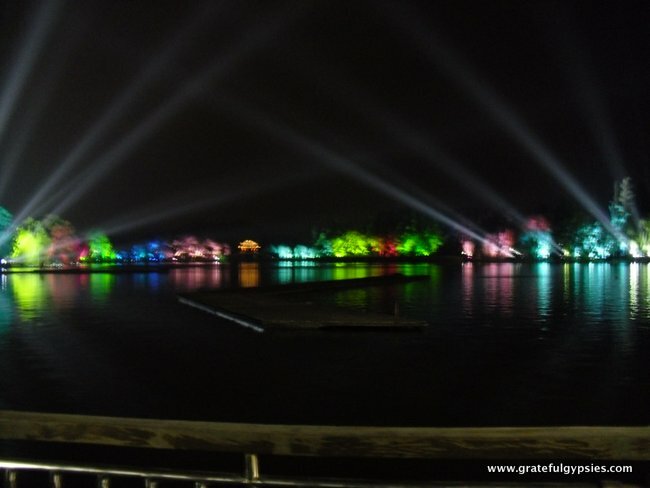 Directed by Zhang Yimou, this show is a love story performed by hundreds of people on the actual West Lake. Even though we didn’t understand much of the dialogue, the sheer magnitude of the show, with its elaborate costumes, props, bright lights, and music was overwhelming. Should you find yourself in Hangzhou, this show comes highly recommended from us. Check out some video highlights of the performance. Flying high after the powerful and moving show, we just had to go out and party. We grabbed some street beers and started walking aimlessly, stopping some younger looking Chinese girls to ask them what the nightlife was like. They pointed us towards one street, where we happened upon a little beer bar that actually served a variety of German and Belgian brews. Back in the area around the Drum Tower after the show, we found a bustling outdoor area with BBQ and cold beer – two of my favorite things. We ordered up a variety of kebabs and a few brews and were seated by the very friendly owner, who insisted on paying us foreign customers much more attention than our Chinese counterparts. Feeling extra brave, I tried one of the super hot green peppers. Mere seconds after biting into it, I could feel my whole face tingling; I swear it was an out of body experience. 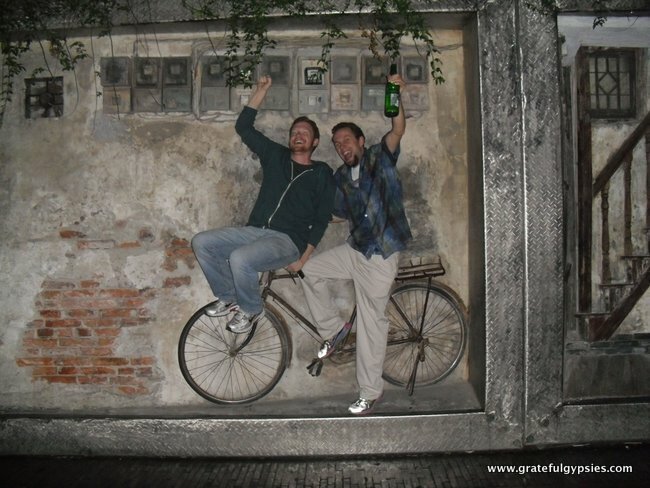 On our walk back to the hostel, we just had to stop for some funny photos with a bike in a wall. The next day, we visited the City God Temple atop a hill, where we took in the views of the West Lake and the entire city from above. Like much of China, Hangzhou is developing at break-neck speed; this was very clear from the balcony of the temple, where we saw cranes as far as the eye could see. A few shots of the hillside temple. In the evening, we were pleasantly surprised when we found a long night market nearby our hostel, featuring a wide variety of tasty street food. We walked up and down, ordering whatever looked or smelled good – sushi, kebabs, noodles, amazing braised pork sandwiches, and more. Full and sleepy, we just hung out around the hostel that night and got some sleep before our trip back to Beijing. All in all, Hangzhou is a very pleasant place to visit, but you’d definitely be better off going there outside of major Chinese holidays. For example, going just after the May Day or National Day holidays could ensure that you’d be dealing with much smaller crowds. Transportation: We took the hour-long train ride from Shanghai to get there. Tickets for this train are 77 for second-class seats or 123 for first. From Shanghai, it’s also easy to catch a bus there. Trains also go to Hangzhou directly from Beijing multiple times a day. Get Around: Walking around the West Lake is nice, but you could also rent a bicycle or take a variety of boat trips. In terms of getting around the city, your best bet is either a bus or taxi. Accommodation: We stayed at the Hofang International Youth Hostel, where we got a double room for 240 RMB/night. Sean also stayed in a dorm room there for just 60/night. It was a bit on the pricey side, but it was in a great location and we even had a little front porch. 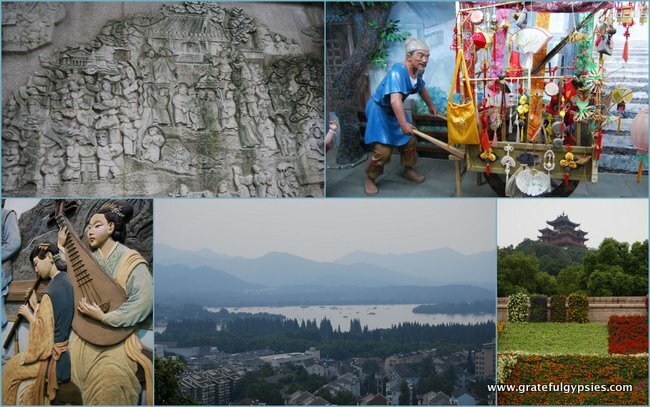 Activities: The #1 thing to do here is take in the scenery of the West Lake. A whole day can be spent wandering around, and then you can catch the Impression show at night. Other than that, there are a variety of temples that you can see, or you can just rent a bike and ride out into the countryside, stopping to hike in tea fields. Food/Drink: Our best dining experiences in Hangzhou came with street food, but if that’s not your thing there are plenty of Chinese and even some Western restaurants around. Hangzhou is a provincial capital and a big city, so there are also a few bars and nightclubs to choose from. Recommended Time: Two or three days should be enough for you to check out the West Lake, see some temples, and do some hiking/cycling. One more Hangzhou video – the City God Temple and some awesome street eats.